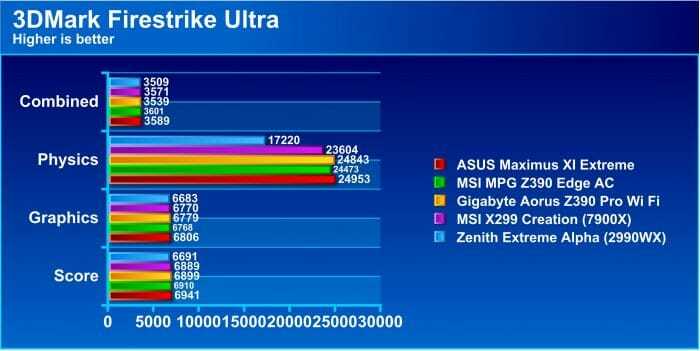 3DMark Firestrike shows that GPU performance is somewhat hindered by the lower clock speed on the HEDT parts but more significantly so on the 2990WX and this also could be due to lack of optimization for CPUs exceeding a specific core count. 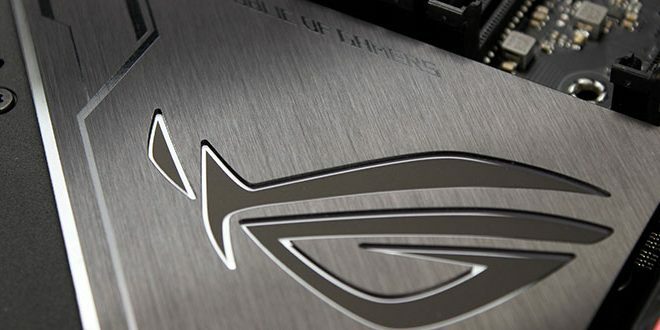 Lets face it, there is simply not many games which were ever designed with 32 cores in mind, and this not being a gaming CPU I gotta make that point. 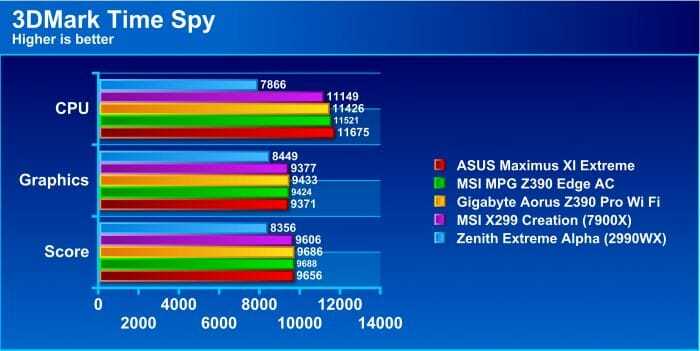 As I know many may consider the 2990WX placved in the Zenith Extreme Alpha as a dual purpose solution offering heavy work capabilities along with gaming prowess, just be aware you will likely be bottlenecking GPU performance a fair bit. 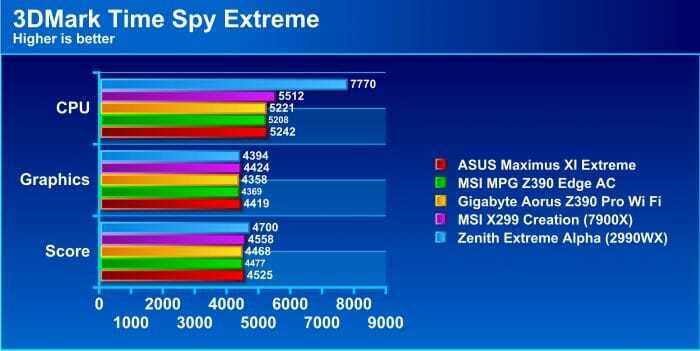 Time Spy being a DirectX 12 benchmark has been interesting as it shows scaling which is repeatable and shows the Zenith Extreme Alpha platform finally get some life for a gaming test. First of all in the standard Time spy test, it was more of the same with the Zenith Extreme Alpha trailing the pack, but turn up the wick to the Extreme test and suddenly the performance is above or within the margin for error of teh otehr platforms. 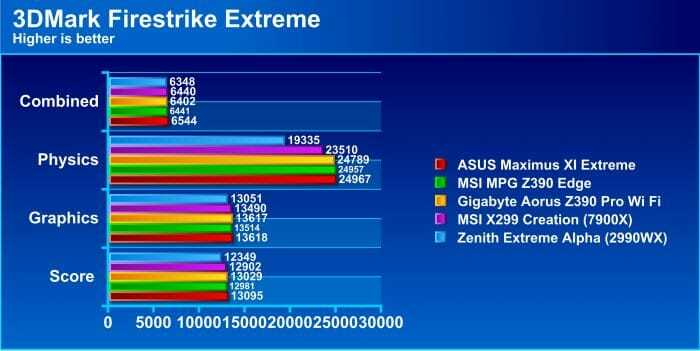 Also, it is worth noting that the extreme variuant shows the 2990WX pulling ahead in the CPU score as it obviously can now see the benefit of the HCC CPU. 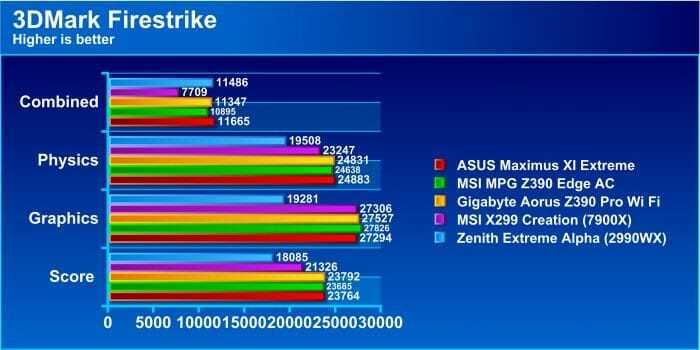 PCMark shows more of the same unfortunately as it favors higher speed mainstream level CPUs with high clock speeds vs HCC CPUs. This does mean that PCMark is of course once again favoring high clock speeds which is no surprise since its geared for mostly everyday productivity and content creation. These tasks are far better suited for the mainstream performance parts like the 9900K or Ryzen 5/7 equivalents. 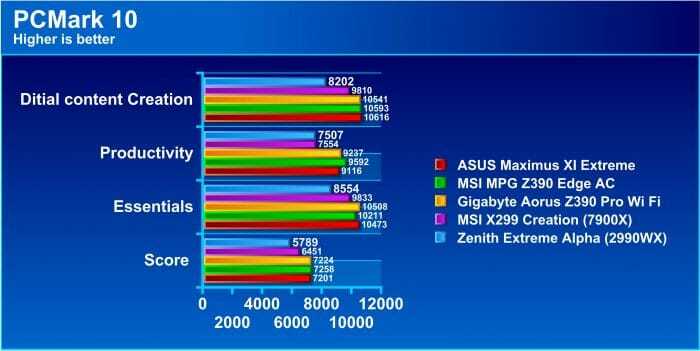 MNost everyday office or personal tasks simply are not geared for HCC CPUs and benefit far more from a slimmer but faster CPU vs a heavy lifting high thread count albeit slower overall unit. Now, as I said, the Threadripper platform is not really a gaming platform in my opinion but still I gotta show how it performs. Onward to the games!